This colossal reference-book clocks in at 542 pages, 1 page front cover, 1 page editorial, 2 pages of ToC, 9 pages of SRD, 1 page echelon reference dashboard, 1 page back cover, leaving us with a staggering 527 pages of content, so let’s take a look! So, first things first – this is a reference work and I will rate it as such. This book focuses on the cleric and my review is based on the iteration that is based on both PRD and 3pp-material from a wide array of different sources. After a brief introduction, we begin with the cleric at a glance, including class skills by attribute, class features and the like; Rite Publishing’s by now venerable Divine Channeler is also listed in such a way. Slightly odd when first reading such a book: Below each bubble is the source of the respective ability noted as well – but there’s a reason for this! On another note: While the rules-formatting of the book is really impressive for a tome of this size, I did encounter e.g. references to cure/inflict spells that are not italicized – cosmetic, but hey – I do have to complain at least a bit, right? Now, if you want something with more of a go-play angle and considered the application of archetypes to a given class work, then you will really enjoy the next chapter – cleric archetype classes basically presents the cleric class with the archetype in question already applied; presentation adheres to the same principles as the base class-depiction – at a glance summary, full information, breakdown by class feature. Each new class/archetype combo begins on a new page, btw. – on one hand, this means that you’ll have a few pages with some serious blank space, but on a plus-side, you can save ink/toner when just printing out one class/Archetype-combo – this makes the section rather helpful, as far as I’m concerned. So yeah, for me, saving ink/toner trumps coping with a bit of white space. It is also here that you’ll probably get why abilities note their sources: archetype class combos note sources for the base class as well as for the supplemental rules-material used in making the respective combination. But what if you want to look up a cleric concept by class feature? Well, chapter 3 has you covered: It lists the class features alphabetically (with type and level) and then proceeds to sport the class name/cleric archetype that sports the feature below it in an extra bubble – this is really helpful, though it would have probably been even more helpful with internal hyperlinking to the respective archetype or archetype class-combo. When a class feature is modified, you’ll find the modifications under their own sub-bubble denoting the archetype in question, which is really neat. Now, I really loved this in the Barbarian-installment, but both class features and feats have helpful feat/ability-chain diagrams illustrating connections – channel energy + domain, for example…and here, we have the extremely helpful hyperlinks once again, so yeah, maximum utility achieved. (it should be noted that class features from other classes are NOT included in the book and thus, not hyperlinked – but that was to be expected and should not be taken as criticism of the pdf!) And yes, when applicable, level bubbles are included here as well! And yes, e.g. the divine channeler gets his own flow-chart-style diagram! Interesting, btw. : Not *all* content herein is drawn from external sources – there are some domains, for example, that reference Echelon Explorations: New Domains – a book not available/released as per the writing of this review; this references the concept of hybrid domains, which is intriguing enough, though, as a minor nitpick, the second such example hybrid featured is missing the “1” in the first-level spell notation of domain spells gained and said domaijn also lacks the level-bubbles for the class abilities gained; not a big hassle, since the information is still within the text itself, but still worth mentioning. Subdomains are provided with the base domain noted behind “/” in the header, which, once again, is useful; it would be even more useful, however, if the specifically noted parent domain had been internally hyperlinked – something that btw. also holds true for the exalted domains featured herein and their respective subdomains. Parent-domains listing and linking their subdomains with hyperlinks would have also imho improved how easily and quickly this chapter can be used. The pdf also features variant channeling, with each of the entries listing both heal and harm options for your convenience; however, once again, the variant channeling options have not been hyperlinked to switch between the respective domain and its variant channeling – while I am a big proponent of the variant channeling having its own chapter, from a comfort point of view, internal switching between the two would have made sense to me. In the section covering feats, we have some serious comfort, though. The book goes above and beyond, with feat-chain diagrams/flow-charts and feats noting domain channeling, when appropriate, in the appropriate bubbles. The book also contains a massive spell-list (though not the spells themselves – they have their own reference-installment) and the pdf moves on to a massive array of diverse NPCs for various CRs – some of these do note the racial traits of the respective race, but not all of the builds come with this supplemental information. In some cases, multiple statblocks of the same NPC are provided for various levels – namely Delfina Ambrosi’s stats. The massive pdf also features a huge index spanning no less than 24 pages that help finding the respective abilities, feats, etc. even quicker. Beyond these, there is a massive 3-pages index that notes the location of the helpful, aforementioned diagrams. Editing and formatting are very good and impressive for a tome of this size, though I did notice a couple of minor hiccups here and there. Layout adheres to an efficient two-column standard that is pretty printer-friendly. The pdf comes with excessive, nested bookmarks for your convenience and makes, combined with the indices, the navigation pretty simple. The pdf does feature a significant amount of internal hyperlinks, but not as many as I’d have liked. 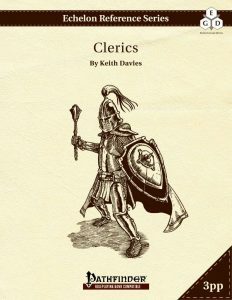 Keith Davies’ massive reference book of cleric options is a great reference tome that helps collate a ton of information; it achieves its intended goal and makes for a well-made offering that should reduce the (electronic) book-keeping required at the table. It is a system-immanent issue that domains can’t be hyperlinked to spells (combining both books would exceed 1K pages! ), but I was a bit disappointed to see the lack of internal hyperlinking between domains & subdomains – that would have added some seriously nice comfort beyond what’s already provided. The diagrams for the respective ability- and feat-chains make for a helpful offering, though. As a whole, I really enjoyed this massive reference tome – we have a helpful tome here, though one that falls slightly short of some comfort it could have provided. Hence, my final verdict will represent that – to me, this is a 4.5-stars-pdf, rounded down for the purpose of this platform. You can get this massive compilation of cleric-material here on OBS! Want just the PRD-version? You can find that iteration here on OBS!